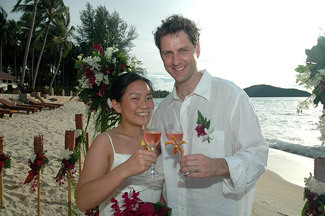 On September 30, 2006, in Koh Samui, Thailand, Bliss and I were married in a beautiful beach ceremony at sunset. It was exactly what we wanted. It was perfect. We highly recommend the people who pulled it all together. Same goes for Tongsai Bay, the place where we stayed — the venue, the service and food were all phenomenal. It wasn’t easy to leave. I may write more about this when I have time, but for now feel free to view our wedding photos and our other photos from Thailand. Because Bliss and I just love getting married, the fun doesn’t stop here. A Shanghai party is in the works, and the big wedding bash will be in Savannah, Ga., in February, on Chinese New Year eve. Thanks to everyone who has offered congratulations. We couldn’t be happier … well, maybe if we were back in Koh Samui.